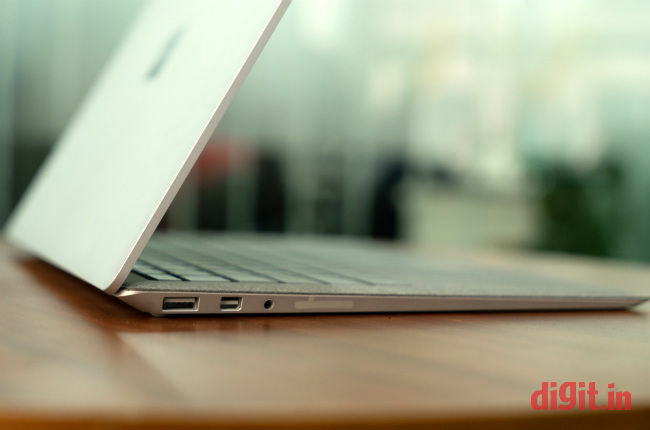 A MacBook-level Windows laptop with commendable design, portability, attention to detail, and performance. Get it if you find the asking price acceptable and aren’t fazed by a lack of IO ports. In June last year, Apple updated its 2010-born MacBook Air yet again with nothing except a newer processor that clocked slightly faster. Meanwhile, Microsoft had just finished forging a new weapon in Redmond, Washington for its fresh assault on Apple—the Surface Laptop, thereby strengthening the rather modest line-up of Surface devices by a bit. It’s been over a year since the Surface Laptop’s launch and the MacBook Air’s mild update. 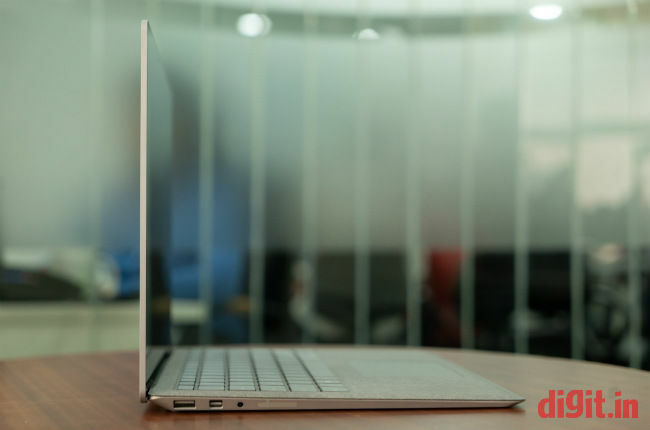 The updated MacBook Air continues to sell in India, but the Surface Laptop (and the Surface Book 2) has only just joined us. Let’s see what we’ve got. 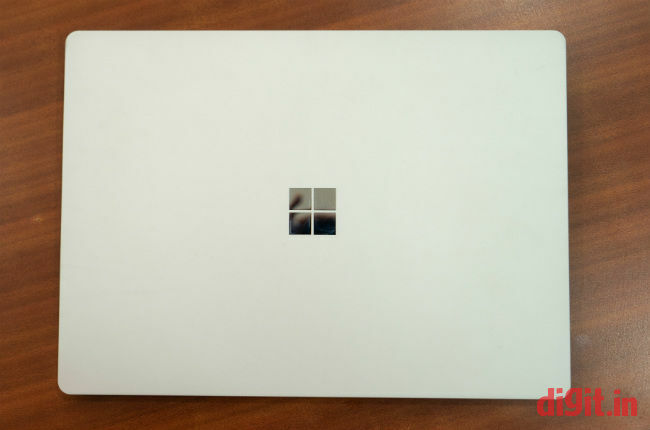 The Microsoft Surface Laptop is one clean rounded rectangle when the lid is shut. 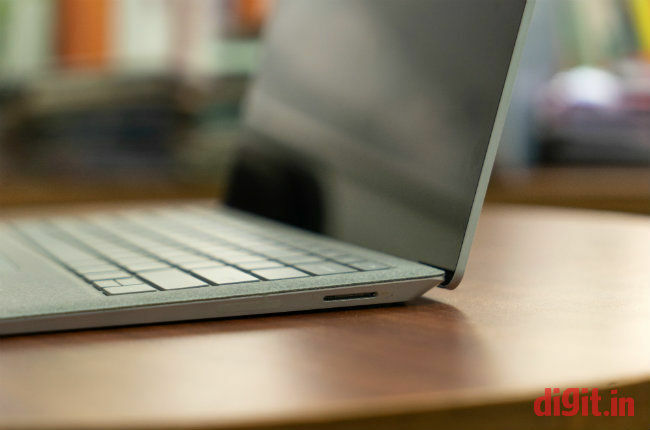 The aluminium cover looks like a clean slate with a tiny tiled mirror (the Microsoft logo) in the middle. The back is almost equally bare if you discount the tiny round rubber feet on all four corners and the etched Microsoft badge. 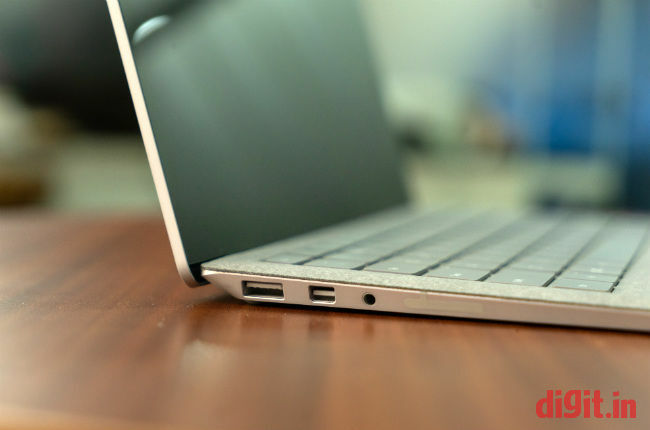 Like the MacBook Air, the Surface Laptop’s base tapers towards the front. The laptop feels grippy to hold in the hands. What’s refreshing about it is that it’s extremely light to carry. Its 1.2-kilogramme body feels equally weighted on all sides and doesn’t feel heavy on any one side. As advertised by Microsoft, the Surface Laptop can be opened with a single finger while it rests on a table. 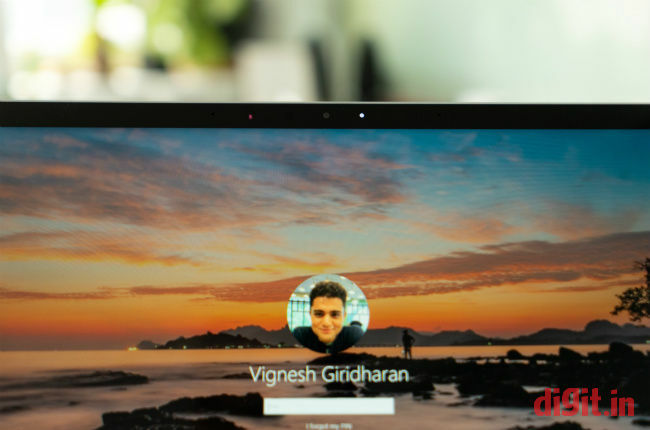 This quality about the laptop is a big factor for users who are constantly shifting from one table to another with a phone or coffee mug in one hand and the Surface Laptop in the other. It’s also a testament to Microsoft’s thoughtful design. The lid is easy to open and it stays firmly in its place even when the laptop shaken about a bit. What’s a disappointment for me is that the lid does not open beyond 135 degrees. I think it’s a disappointment for more than one reason. A lid that folds all the way back to 180 degrees (if not farther back into a tablet form) is more convenient for odd working positions. Also, it hinders flexibility when using the touchscreen, especially with a Surface Pen stylus. Pushing the lid back beyond its limit on one side reveals some flex on the surface of the lid. It’s a little scary to watch but the lid shouldn’t crack unless you intend to damage it. The inside of the lid contains a laser-cut glass, which, according to Microsoft, is not mass produced for reasons of quality. A piano black bezel of half an inch surrounds the 13.5-inch display and lends the laptop a classy look. 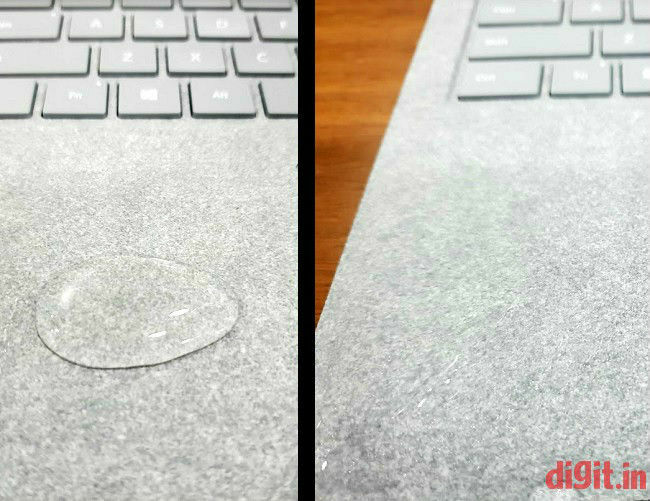 The area around the keyboard and the touchpad is made of Alcantara, a durable microfibre material that’s also spill-proof. All in all, the build of the Surface Laptop is promising, even if there are signs of flex on the lid and keyboard. This laptop should survive scratches and, with any luck, the occasional fall. 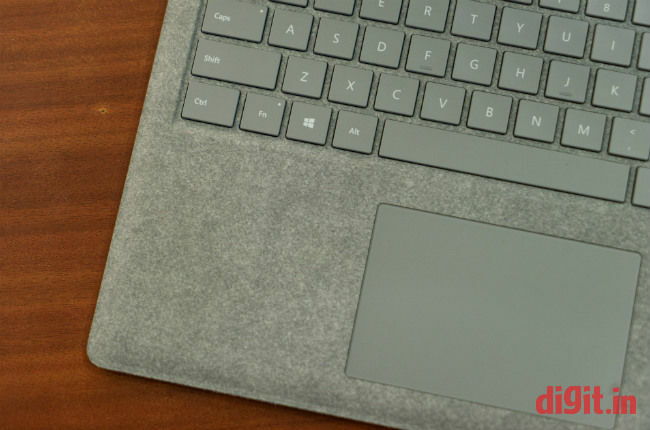 If there’s anything unnerving about the Surface Laptop’s build, it’s that the touchpad’s click buttons can be depressed when the lid is closed and pressed hard. The Surface Laptop has only one display option: a 13.5-inch PixelSense touchscreen unit. With a resolution of 2256 x 1504 pixels on a screen of that size, pixel density sits comfortably at 201 pixels per inch. Accustomed to seeing letterbox formats on screens all my life, I personally like seeing the 3:2 aspect ratio make a return on the Surface Laptop. It’s a refreshing change from the widescreens of today and a trip back to memory lane. Colours on the Surface Laptop's display are vivid and screen brightness is available in excess. Contents on the display are visible clearly in all conditions, bright or dark. The only fly in the ointment I see here is the presence of a glossy finish on the display. This makes the screen highly reflective, and thus, content more difficult to read in certain angles. The Surface Laptop's IR camera works promptly and logs you in to Windows without a fuss nine out of ten times even when the room around you is dark. Touch response on the Surface Laptop's display is quick and precise. Palm rejection works accurately while writing and drawing. Sadly, I did not get a chance to test the performance of a Surface Pen stylus on the PixelSense display, but I found finger inputs to be spot on. I have but one grouse with the Surface Laptop's display. It's that its hinge does not allow the display to go any farther than 135 degrees when pushed back. Given that the device has support for an extremely capable stylus like the Surface Pen, this limitation seems to me like a missed opportunity. Then again, allowing the display to fold all the way back to meet the base would've made it a Surface Flip or a Surface Tablet, and not a Surface Laptop. Nevertheless, a folding angle of 180 degrees would've been more useful. Sadly, Microsoft felt it was more important to minimise the gap between the base and the display for reasons of aesthetics. Part of the reason why the Surface Laptop's base is so clean is that it has no speaker grilles there. So where have the speakers gone then? Microsoft has cleverly placed them under the keyboard. According to Panos Panay, Vice President of the company's Xbox and Surface brands, it's done so to achieve a more 'enveloping sound'. You'd imagine speakers hidden beneath the keys of a keyboard to sound muffled or feeble, but there's none of that here. The speakers on the Surface Laptop are powerful enough to fill up a quiet bedroom of 25 x 25 feet with loud music when the volume is set to eighty percent. Bass output is weak, but vocals and high frequencies can be heard playing crisply through the keys. Maintaining a slim figure comes at a cost. To stay as thin and light as possible, the Surface Laptop has lost some essential ports that could've come in handy for power users. The total number of ports on the Surface Laptop can be counted on a single hand. On the left there's a full-size USB port, a Mini DisplayPort, and a 3.5mm audio jack for headsets. On the right there's the Surface Connect power port and nothing else. In the process the Surface Laptop says no to HDMI, USB Type-C, and additional full-size USB ports. If port availability is important to you, then you might want to look away from the Surface Laptop or prepare yourself to buy a bunch of fat dongles. If it’s any consolation, the Surface Laptop’s petite power brick has a full-size USB port for those many moments when you need a USB port only for power and not for data. Initially I disliked the magnetic connector of the Surface Connect power port for being too loose and coming off at even the slightest tug, but then I realised the many instances in which it saved me after I’d accidentally stepped on the power cord. All those moments considered, I think the magnetic connector is a blessing. The keyboard on the Surface Laptop is one of its best features. Despite being flat, the keys on the keyboard have ideal characteristics: key pitch (the distance between keycaps) is appropriate. Key travel (how far down a pressed key goes) is ample despite the base's slimness. Key resistance (how hard each keypress is) is also ideal; the keys are neither too hard nor too soft, making each keystroke extremely easy to register. 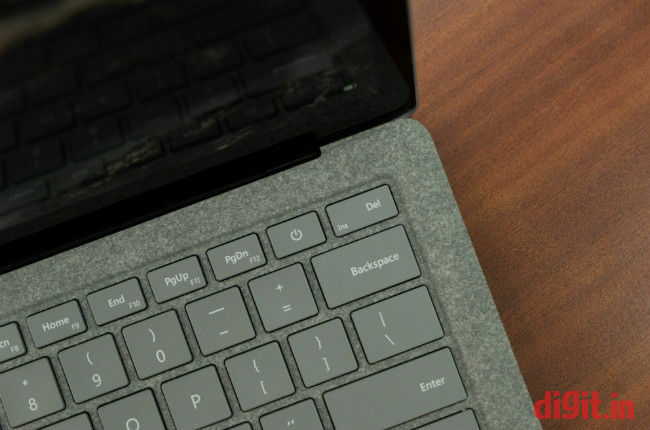 The F-keys on the keyboard are lockable with a single press of the Function button on the Surface Laptop's keyboard, which is good news for those who depend on them heavily. Microsoft has been thoughtful enough to include the context menu key in the keyboard for easy right clicks. It's a button that's rather uncommon on the laptops of today; so it's comforting to see it still doing duty, especially on devices made by the makers of the Windows OS. To accommodate it, Microsoft had to remove the right-side Ctrl key. This makes using key combinations on the right side of the keyboard a proper pain. You just can’t have everything in life, can you? All in all, the keyboard on the Surface Laptop is perfect for somebody whose job (or hobby) involves a lot of typing. I think it's the next best thing to a ThinkPad keyboard. Personally I would have liked to see dedicated keys for Home, End, Page Up, and Page Down functions, but I suppose you can't have it all on a keyboard of this size. I also find the overall layout of the keyboard pleasing to eye; it's like looking at a freshly unwrapped bar of white chocolate with the keys being the tiny blocks. The touchpad on the Microsoft Surface Laptop is a precision unit, which comes as no surprise as Microsoft is keen on bolstering every new laptop touchpad out there with a precision specification. The touchpad is neither too small nor too large. Taps, clicks, and swipes all happen smoothly and precisely. What I found a little unsettling was the fact that pressing some of the areas just around the outer perimeter of the touchpad resulted in an accidental click. The Surface Laptop cuts a slightly sorry figure on the spec sheet because it features last year's Intel Core series processors but makes up for it in real-world-usage scenarios. The model I received for review had a seventh-generation Intel Core i5-7300U processor. RAM was a healthy 8GB and storage was an acceptable 256GB. Graphics were taken care of by an integrated Intel Integrated 620 UHD GPU. The Surface Laptop scored moderately well on benchmark tests. 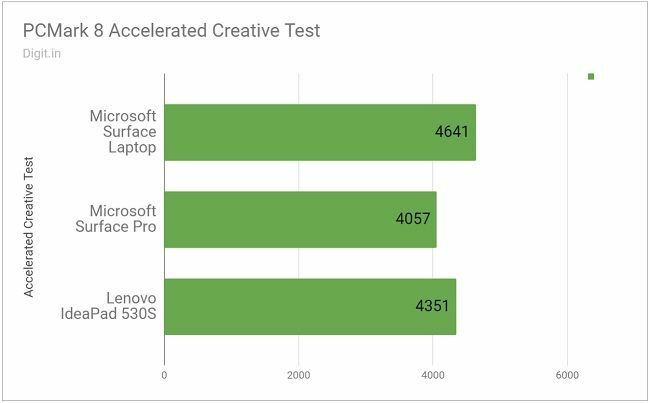 The sleek Microsoft device trumped the Lenovo IdeaPad 530S in the PCMark 8 Accelerated Creative test by almost three hundred points. On graphics benchmark tests like 3DMark’s Fire Strike and Sky Diver, the Surface Laptop scored less than half of what the IdeaPad 530S had. This drop is score is expected because the Surface Laptop employs an Intel Integrated 620 UHD Graphics GPU and has no dedicated video memory. In the real world, the Surface Laptop’s performance is quite admirable. Running eleven applications simultaneously (where one was a YouTube page playing video) showed no signs of lag or judder. Switching between windows and virtual desktops was a breeze, and at no point did the animation freeze. When applications were installing the heat under the laptop rose, but not by too much. With graphics settings set to medium, the Surface Laptop ran Metro:Last Light at a pitiable 20 frames per second and Doom at an even more pitiable 11 frames per second. Gameplay on Doom was visibly laggy and difficult. What’s more, the game couldn’t recognise the laptop’s unusual aspect ratio and resolution. CPU package temperature rose over 70 degrees Celsius, and the heat could be felt on the base just under the display hinge and on the keyboard while moving around. Sure, the Surface Laptop is no gaming machine with frame rates like that but gets the job done when your workday poses a litany of boring spreadsheets, documents, and web pages. The Surface Laptop is capable of crunching numbers very well, but don’t ask it to render graphics the same way. It’s a great machine if you’re into a lot of research and writing. Microsoft says that the Surface Laptop’s battery has been designed to retain charge for up to 30 days when it’s shut down and shelved. It’s yet another hint that Microsoft is gunning straight for the MacBook users. The laptop scored 4 hours and 12 minutes on our battery benchmark test, which is pretty decent, considering it’s nearly an hour and a half more than what the IdeaPad 530S managed. During the time I had the Surface Laptop, the device lasted me somewhere between 5 and 7 hours on battery power. During most of these tests, I had Wi-Fi turned on and Bluetooth turned off and had seven applications running simultaneously. On a five-hour flight where Airplane Mode and the keyboard light was turned on, the Surface Laptop lasted me the whole duration with about 40 percent charge left to spare. 7 hours and above is a decent figure for a laptop of this size but not too great for a laptop of its price. The Microsoft Surface Laptop is an excellent computing device for somebody who wants a thin and light laptop for the office and the road. It’s ideal if you want to do a lot of typing and browsing, but it’s not so good when you want to play with graphics and videos. The Surface Laptop is definitely worth a buy if you’re looking for a MacBook that runs Windows, and runs it well. You’ll love its build, finish, performance, and portability. Since there’s a huge price difference between the 128GB and 256GB SSD model, we suggest you get the former if your work can run off external storage. Which is the best Microsoft Windows? What happens if I touch the surface of a CD? surface pro 4 and macbook air which is the better............?